This Chicken Potato Salad is made with juicy chicken, red potatoes, sweet grapes, crunchy celery and bell pepper, and green onions. 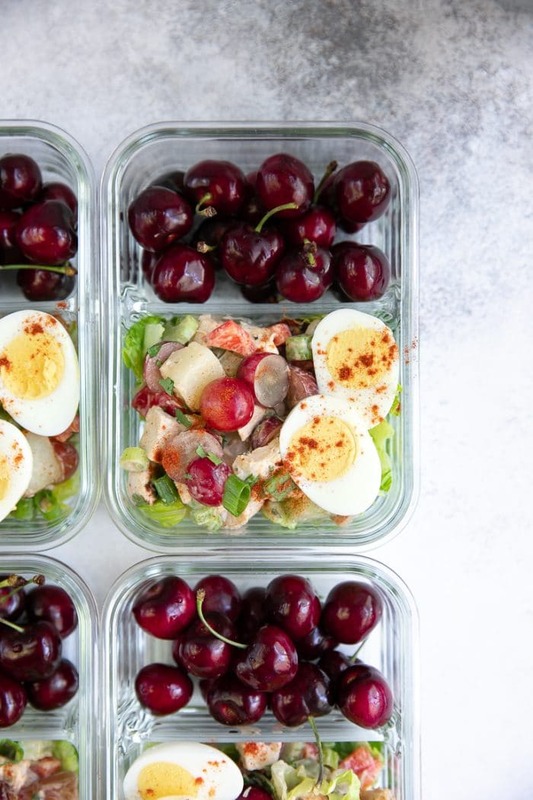 A lighter and healthier alternative to the classic potato salad, this Chicken Potato Salad Recipe is an easy, protein-packed meal prep solution perfect for work lunches or back-to-school. 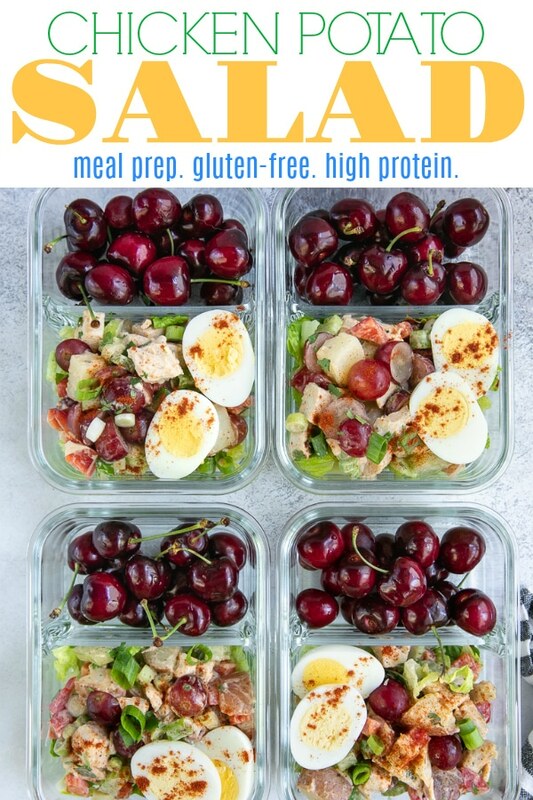 I really hope you love meal prep as much as me (like, really really love meal prep) because the more I meal prep, the more I want to meal prep. Take this week, for example. Somehow, by accident (not really) I snuck three meal prep breakfast recipes on my meal plan for the week. Back-to-school is coming and one can never be too prepared. Or, in my case for this week, eat too much breakfast food. But, I digress. We can talk about breakfast another day. For today I’m sharing this super easy Chicken Potato Salad Recipe. You will notice a few little notes right next to some ingredients directly above. As with nearly all recipes I share here on this blog, please use the recipe as more of a guideline rather than an exact formula. So, if you don’t like spicy chicken potato salad, then I highly advise against adding the chopped jalapeño. The same can be said for the Cajun seasoning. Personally, I fell that this basic spice mix adds loads of flavor, but if it’s not your flavor of the week, don’t do it. For the person who doesn’t eat carbs– technically, this chicken potato salad recipe doesn’t really need to be a potato salad at all. You could, if you really want to, leave out the potatoes. If you do this, I suggest doubling the amount of chicken. Grapes freak you out or they’re not in season- you definitely need something sweet in this chicken potato salad or non-potato chicken potato salad (whatever you call it). If you hate grapes, I would replace them with raisins, dried cranberries or chopped sweet apple. However, note that if you use an apple, you may not want to add it until just before serving (in other words- not good for meal prep). You’re dairy-free- Aside from the mayonnaise, this chicken potato salad recipe is completely dairy-free. You can easily use a dairy-free mayonnaise such as this Avocado Oil Mayo and be good to go! What about gluten? There is no gluten. Do not overcook the potatoes. Here’s why- if you overcook those potatoes, you’ll end up with Chicken Mashed Potato Salad. Now, I have never tried this personally and while I have a sneaking suspicion that it may taste pretty ok, we are not making mashed potatoes. The potatoes should be just fork tender. Allow the potatoes and chicken to cool before adding the mayo. They don’t have to be cold (although you could always make the potatoes and chicken ahead of time), but I would wait for them to stop steaming. Find your perfect mayo to chicken and potato salad balance. In other words, I recommend adding one cup of mayonnaise to this recipe. However, for some of you, that may seem to be just way too much, while others reading this may need double that amount. Find your perfect amount by starting with less and adding more. Meal Prep Bowls: You will need something to store and hold all your delicious Chicken Potato Salad, right? These are my recommendations. 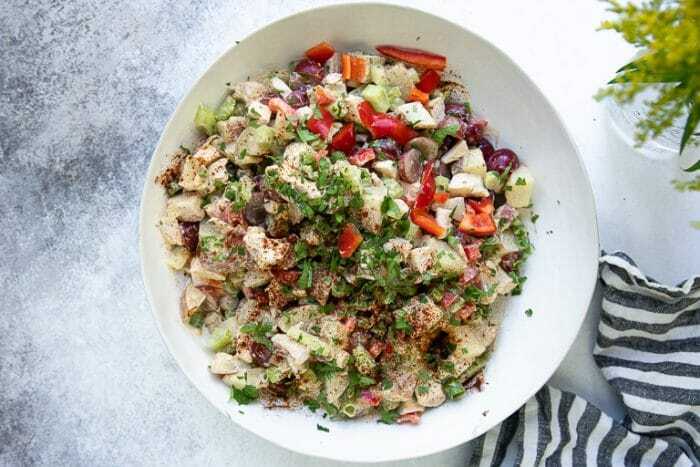 This Chicken Potato Salad is made with juicy chicken, red potatoes, sweet grapes, crunchy celery and bell pepper, and green onions. 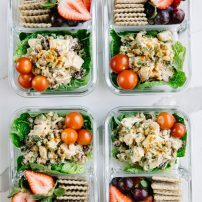 A lighter and healthier alternative to the classic potato salad, this Chicken Potato Salad is an easy, protein-packed meal prep solution perfect for work lunches or back-to-school. Optional: omit the red potatoes and replace with additional chicken. You may also mix the hard-boiled egg directly in with the salad if desired. Prepare the chicken- Bring a medium pot of water to a boil over high heat. Add chicken breasts to the boiling water and return to a rolling boil. Allow chicken breasts to simmer for 5 minutes then cover the pot with a tight-fitting lid and remove from heat. Allow chicken to poach in the boiled water for approximately 30 minutes. Meanwhile, add the diced potatoes to a pot and cover with cold water by at least two inches. Bring water to a boil and cook potatoes until fork tender. Remove from heat, drain, and rinse with cold water to stop cooking. Transfer to a large mixing bowl. 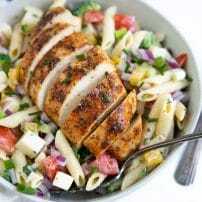 Remove the cooked chicken from the pot of water and chop into small bite-size cubes. Transfer to the large mixing bowl with the potatoes. 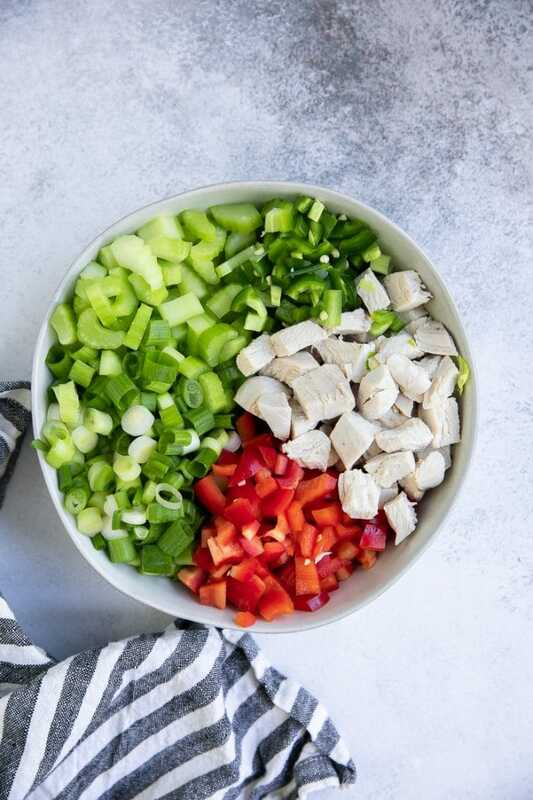 To the same bowl as the chicken and potatoes add the celery, green onion, jalapeño, red bell pepper, and red grapes. Gently toss to combine. In a separate, smaller bowl, whisk together the mayonnaise, apple cider vinegar, cajun seasoning, sweet paprika, and salt and pepper. Transfer mayonnaise mixture to the potato mixture and toss to combine. 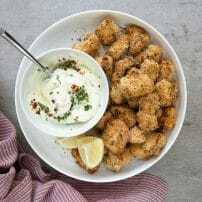 Season with additional salt and pepper, to taste and garnish with fresh chopped parsley if desired. 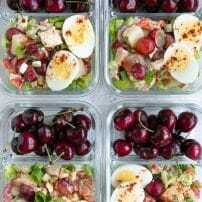 Assemble meal prep bowls- Divide chicken and potato salad between meal prep containers and top each with one hard-boiled egg, if desired. Serve with fresh fruit, carrot sticks, and crackers, or any other foods that store well in the refrigerator for 3-4 days. Want to try this Chicken Potato Salad Recipe? 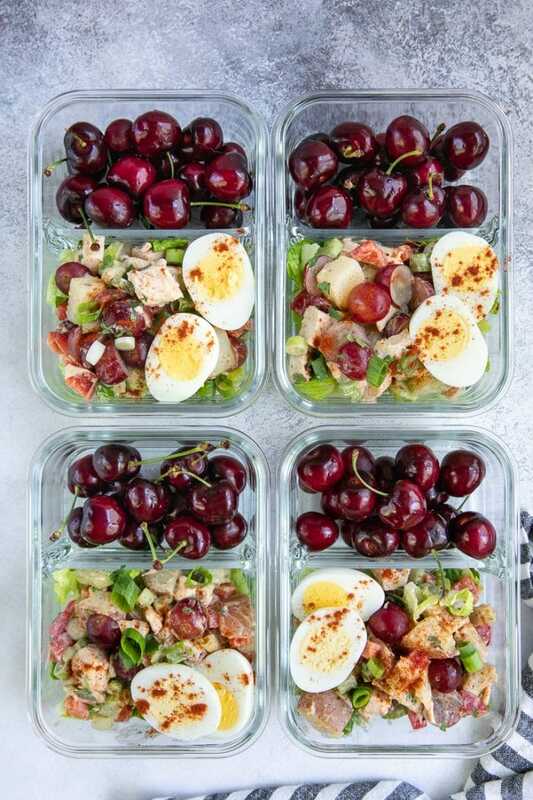 to your Lunch or Meal Prep Boards on Pinterest and save it for later!